2015 is the 17th edition of Bridal Asia, sub continent’s biggest bridal exposition. Asia’s premium trousseau show is back with a bouquet of handpicked designers, jewellers and lifestyle experts, as they showcase a range of trousseau, jewellery, accessories, silver ware, lingerie, linen at Hotel Ashok, New Delhi. Since its successful inception in 1999, Bridal Asia quickly established itself as a first of its kind destination for making bridal shopping, easy, contemporary, fun and accessible. The three-day exposition will unveil the finest collections of every conceivable requirement for the bride and groom – all carefully curated and put together painstakingly by top-notch names in bridal finery. Fashion stalwarts from India and the subcontinent including Tarun Tahiliani, JJ Valaya, Falguni & Shane Peacock, Manish Arora, Vikram Phadnis, Rohit Bal, Honey Waqar (Pakistan), revivalist of Benarasi craft, Abha Dalmia will be seen sharing space with a host of talented home grown names and represent the new brigade of young couture talent such as SVA, Swati Ubroi, Nidhi Tholia, Ridhi Mehra, Sonali Guota, Arpita Mehta, Supria Munjal, Pooja Shroff , Anushree Reddy , Sahil Kochar amongst others . Leading jewellery brands will come together to showcase their finery at Bridal Asia. 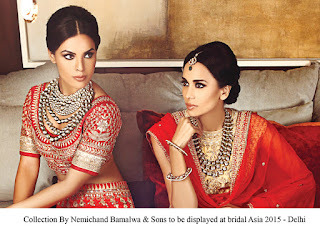 Carefully curated by team Bridal Asia, each brand brings their unique cuts and stones, interpreted in varied regional forms from all corners of the country across Jaipur, Kolkata, Mumbai, Hyderabad and Chennai. Sajjante Fine Jewels, Birdhichand Ghanshyamdas Jewellers of Jaipur, Mehta Brothers are some of the jewellers who will be showcasing their wares along with the old regulars like Nemichand Bamalwa, Rawat Jewels, Khanna Jewellers , Umrao Jewels of Jaipur amongst other leading names. Bridal Asia promises to be a one stop destination to fulfil all that a bride can dream of for her wedding. Venue: ­­­­­­­­­­­­­Hotel Ashok, New Delhi.